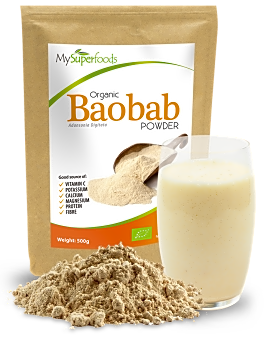 Boasting an impressive nutrient, trace mineral and vitamin profile that offers a number of health benefits, MySuperfoods’ organic baobab powder is made from the nutritious pulp of Africa’s baobab fruit – a sacred botanical that predates humanity! A rich source of vitamin C, calcium, potassium and magnesium, incorporate this exotic supplement into your everyday diet to enhance the body’s functioning. 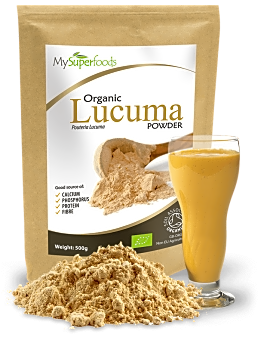 Made from the fleshy fruit pulp of one of Africa’s most ancient trees, MySuperfoods baobab powder is extracted from a protective hardened case, de-seeded, milled and then sieved for a supreme level of quality. Certified 100% organic by the Soil Association, this citrusy flavoured supplement may contribute to immune system support, healthy gums, improved skin health, fatigue reduction, balanced electrolytes, regenerated vitamin E, and nervous system support. Grown in wild savannas, baobab is increasingly becoming a kitchen staple in health-conscious homes. Simply add a spoonful of this zesty, sherbety-like substance to smoothies, juices, fruit salads, porridges and desserts. Brimming with essential vitamins, antioxidants, trace minerals and nutrients including vitamin C, potassium, magnesium and calcium, MySuperfoods’ organic baobab powder is the 21st century’s health supplement must-have!